Play Slingo Fortunes | Earn Top Bonuses @ Moon Games! Time for a combination of slot and bingo! 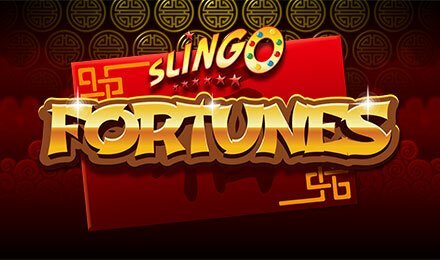 Check out Slingo Fortunes at Moon Games, a top online casino. It is brought to you by Gaming Realms and is playable on desktop and mobile devices. Revolving around a Chinese theme, it brings bright colours and an amusing gameplay. It is set against a 5x5 grid on which you can see 26 envelopes. Spin the reels and match the numbers. Who knows which rewards may be hiding behind these lucky red envelopes! Looking forward to the game on Slingo Fortunes? Start by clicking on the + and – signs to select your preferred betting amount. Commence the game by pressing the Spin tab. You are first provided with 10 spins. When these run out, you can either purchase more or use any free spins earned during the game. With each spin, 5 numbers land on the reel, that is one for each column. When a number on the reel matches the one on an envelope above, the prize value of that envelope is revealed and removed from the grid. During your gameplay on Slingo Fortunes, aim at getting a Slingo by opening 5 envelopes in a row diagonally, vertically or horizontally. Thus, you can climb one step up the prize multiplier ladder found on your left. When you achieve 5 or more Slingos, your prize value multiplier increases by 1x per Slingo, going up to 7x! Hit 4 Slingos to earn another prize on offer depending on the values left in the game. The round ends when you click on “Accept” to take the offer. Alternatively, you can “Reject” it to continue playing for better prizes. Are you ready for the fun? Amount of Paylines Selection: Slingo Fortunes does not consist of any paylines. Coin Values: Choose any stake values ranging from 1.00 to 100.00 units. Look out for Jokers on Slingo Fortunes! They act as Wilds and open any envelope in the column in which they show up. The Super Jokers are also Wilds which can open any envelope on the entire grid. Fancy some free spins? Look for the “Free Spin” icon on the reel to receive an extra free spin at the end of the round. Beware of the Devil symbol! This icon blocks any potential matches on the grid. Launch Slingo Fortunes at your favourite online casino, Moon Games and have plenty of fun. Best of luck!